Is it time to replace your old garage door? Choosing a new unit is certainly not a simple task. It's important to take your time and carefully consider all of your options, as you have to make several important decisions that will potentially affect your home's safety and security for the next couple of decades. The most important thing is to get the size right. Measure the length and height of the opening carefully. Another important thing to consider is the weight of your current door. Unless you plan to replace the opener as well, you must make sure that your new door won't be too heavy for your current opener. Otherwise, you could experience several dangerous problems. Which is the best material for your new garage door? Steel is the most popular choice because of its strength and durability. For coastal areas, the vinyl units are gaining greater popularity as they can resist the damage caused by the salt and sand which seem to be found in abundance throughout those regions. A wooden door can be beautiful, but it is also quite heavy and requires special maintenance and regular repainting. With steel doors, you have the largest choice of structures. A single-layer door is light and offers a low level of insulation. The two-layer panels have a steel front and polystyrene insulation attached to it. When the structure has three layers, there is typically polyurethane foam filled between two sheets of steel. The latter design option usually offers the highest R-value, but it is also the heaviest type. You can also get an insulated wooden door with two layers of wood and a layer of polystyrene in between them. When it comes to insulation, you have two options - rigid polystyrene, and polyurethane foam. The latter material has a higher R-value for the same thickness. It is also more resistant to moisture and mold damage. At the same time, it is heavier and more expensive too. You should consider your individual needs, requirements and budget before deciding on the structure and insulation of the door you're going to get. When it comes to style, the sky is the limit. All the top brands have various customization options to offer you. 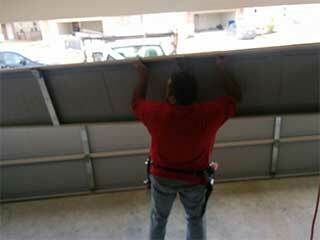 Be sure to contact our experts at Garage Door Repair San Diego to get all the help you need.